As of FactoryPMI 3.3.0, the Table component supports editing in its cells. This feature allows the user to edit cell data by double clicking in the cell. The information can then be sent back to the SQL database without creating a form in FactoryPMI. 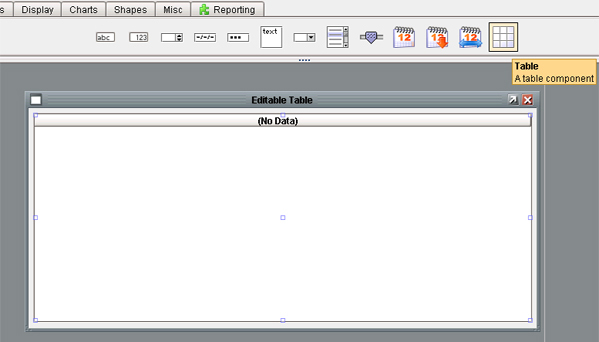 This article describes how to setup and configure the table to allow editing. The first step is to drag in a Table component, from the Input tab on the Component Palette, into a Window. Once you have the table selected or query entered press OK and your data will come through on the table component. Now that the table component is showing data, you need to set which columns will allow the user to edit in the run-time. This way a user can double-click in any cell in those columns to change the value. To do this, right-click on the table component and select Component Customers -> Table Customizer. 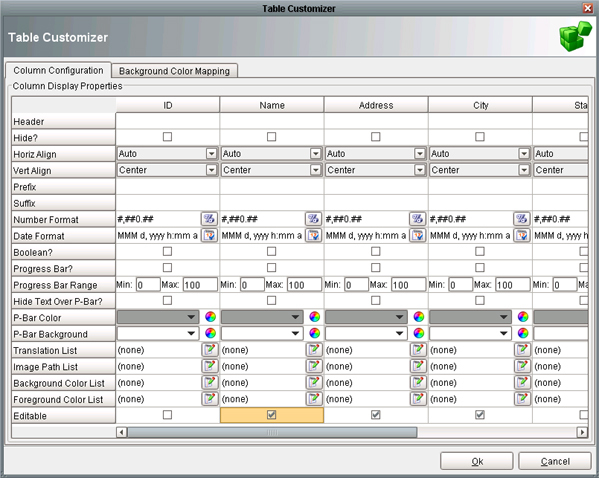 The Table Customizer is where you configure the columns' display properties, as well as any row mapping configuration. 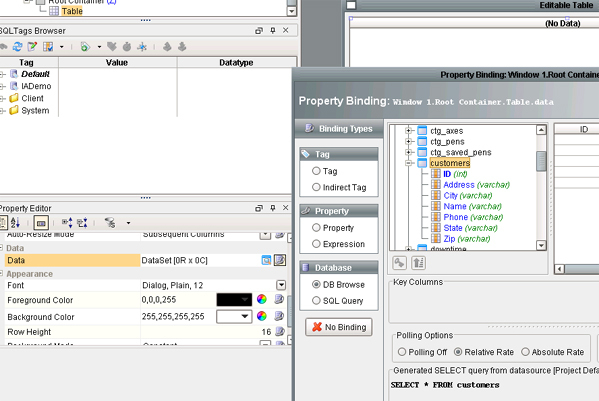 When you open the Table Customizer, you will see a table that has all of your data's columns across the top, and all of the column display properties across the left. You can configure each column to have its own display properties. Once such column display property is called Editable. By checking the box you are allowing that column to become editable in the run-time. Once you have selected all of the columns you are allowing to be editable, press OK.
Any time a user double-clicks in an editable cell and changes the value, all valid changes will be reflected back in a change to the table's data property. The SQL table does not get updated automatically. At this point, all changes can be mapped back to a database in scripting. Once a valid change has been made, the table will fire a cellEdited event that contains the row, column, previous value, and new value for the cell. Remember, if the table's data is bound to a polling query binding, the edited dataset will be overwritten with whatever is in the database. 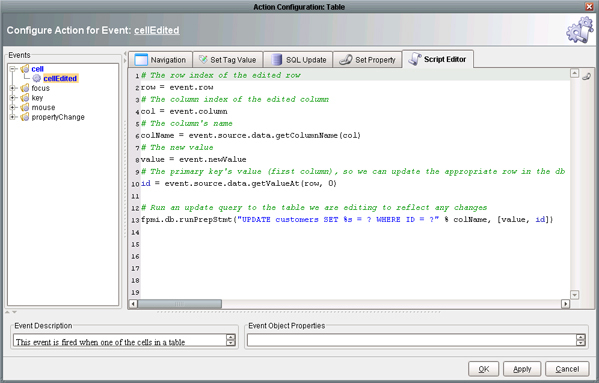 You can use the cellEdited event to issue a SQL UPDATE query that will make the edit in the database as well. Copy the script into your project and change the table name to reflect the SQL table you are editing. Save your project and open up a FactoryPMI client to give your new editable table a try. If you would like a pre-made editable table to learn from, download it here. For information on how to install the pre-made editable table click here for instructions. As always, if you have any questions about this article please visit our forum at http://forum.inductiveautomation.com or call us at (800) 266-7798 for support.